Since the first days of the U.S. blockade, the Guild has prominently promoted friendship with the people of Cuba, and defended the U.S. solidarity movement from government repression and attempts to curb its association and expression. This work has shown the Guild at its best. Victor Rabinowitz, an NLG founder, was the president of the Fair Play for Cuba Committee, the first group in defense of Cuba, before resigning when his firm, then Rabinowitz, Boudin and Standard, was retained by Cuba as the government’s lawyer in the U.S. in 1960 (by Che, personally, in a meeting and chess game with Victor and Leonard Boudin). Leonard Boudin represented the first group of travel challengers, in a case where the U.S. Supreme Court affirmed dismissal of a prosecution for arranging travel of 58 Americans to Cuba. NLG members were members of Venceremos Brigades beginning with the first Brigade. Former national NLG president Karen Jo Koonan and former NLG International Committee chair and Western region RVP Joan Andersson were on the second Venceremos Brigade in the winter of 1970, just before the opening of the Bar Sinister law collective in Los Angeles. It was on this brigade that Karen Jo explained to Cuban Brigadistas the Guild’s role in supporting U.S. solidarity movements, and the first organizational NLG delegation was conceived. Karen Jo led a “California NLG delegation” in December, 1970. Another NLG delegation was famously turned back in Mexico City as a result of U.S. government intervention. In August 1972, the first official national NLG delegation, hosted by ICAP (the Instituto Cubano por Amistad Con Los Pueblos), took place. Karen Jo, then in the National Office Collective, accompanied this group. More “official” delegations followed throughout the 1970’s and early 1980’s, which were formative leadership experiences for NLG leaders and national office staff. These “official” groups expanded the Guild’s role providing legal support for U.S. organizations engaged in Cuba solidarity work. An important intersection between the Guild’s organizational work and legal support for U.S. solidarity movements came in 1977 when the Guild created a “path” for Cubans to obtain visas to come to the U.S. and speak to U.S. audiences. The NLG’s 40th Anniversary Convention in Seattle in August 1977 was the first time Cubans were given visas and were able to speak to a U.S. audience outside the United Nations since the beginning of the blockade. (The three speakers were two representatives of the Federation of Cuban Women, Maria Yolanda Ferrer and Ana Maria Navarro; and a Cuban Supreme Court Justice, Enrique Marimon Roca.) Many guests from Cuba followed in the 1980’s and 1990’s, with Ruben Remigio Ferro, the President of the Supreme Court of Cuba, making his only visit to the U.S. at the October 1999 NLG Convention in San Francisco. The Guild’s Cuba solidarity work grew rapidly in the late 1970’s and 1980’s, during which time several hundred Guild members visited Cuba on people-to-people Guild-sponsored groups, and the Cuba Subcommittee was created at the Seattle Convention. When the Reagan Administration resumed a policy of overt hostility toward Cuba, the NLG’s unique legal support role became especially notable. In addition to the NLG Cuba Subcommittee’s work, Guild members undertook legal support of Cuba solidarity organizations throughout the U.S. To name only a few Michael Krinsky a partner in Rabinowitz, Boudin, Standard, Krinsky & Lieberman, has represented the Center for Cuban Studies, and represented Medea Benjamin’s Freedom to Travel Campaign, the last big legal challenge to the travel ban; Michael Smith and former NLG national president Michael Ratner have written books, done speaking and organized panels. Michael Ratner with Jeanne Mirer filed a brief in support of certiorari for the Cuban 5 in the U.S. Supreme Court; Marty Stolar represented Cuban filmmakers in early years and in recent years defended IFCO and Pastors for Peace; former NLG Los Angeles Chapter president Barbara Honig was on an early NLG delegation and became a leader of the Venceremos Brigade in Southern California; Claudia Slovinsky staffed the Cuba Resource Center; the late Claudia Morcom of Detroit went to Geneva to testify for the Cuban 5 in the UN on the Guild’s behalf; Dean Hubbard and Joan Hill have led 16 annual NLG Labor and Employment Committee study trips to Cuba, and brought the leading Cuba union and employment lawyer Guillermo Ferriol to a series of NLG conventions over the last decade; Cynthia Anderson Barker has been a member of the NLG Cuba Subcommittee’s “Wall of Lawyers” network in Los Angeles; Jeffrey Fogel, a former NLG International Committee co-chair and CCR Legal Director organized CCR’s project to represent activists whom OFAC assessed civil penalties; James Klimaski of the DC Guild has been the NLG’s and CCR’s “local counsel” in a number of legal cases involving challenges to the U.S. blockade of Cuba; Hal Mayerson founded the Cuba Subcommittee in 1977 and along with Franklin Siegel of the NLG National Office organized the first visit of Cubans granted visas and allowed to appear and speak in the United States to come the NLG’s 40th Anniversary Convention in August 1977. Hal was the attorney for the Antonio Maceo Brigade as it created the historic first step toward reconciliation between Cubans resident in the U.S. and Cuba; Franklin Siegel represented the Venceremos Brigade and the U.S.-Cuba Medical Project; Sarah Wunsch of Boston was lead counsel in Nation v. Haig, the successful lawsuit brought by the NLG and CCR challenging OFAC’s attempt to require licenses to import books, newspapers and First Amendment materials such as posters from Cuba; former National Office staff member Gerald Horne has written the Monthly Review Press book “Race to Revolution: The United States and Cuba During Slavery and Jim Crow”; Art Heitzer for the Cuba Subcommittee organized 200 NLG members and families to attend the XVth Congress of the International Association of Democratic Lawyers in Havana in October 2000; and also with CCR set up and trained a national network of over 50 lawyers to advise and represent U.S. travelers to Cuba during the travel crackdown in the years 2000-2006, including assistance at all of the dozen “trials for travel” held in Washington D.C. under George W. Bush and has provided continued advice to U.S. travelers ever since; Leonard Weinglass and Rafael Anglada Lopez represented the Cuban 5. 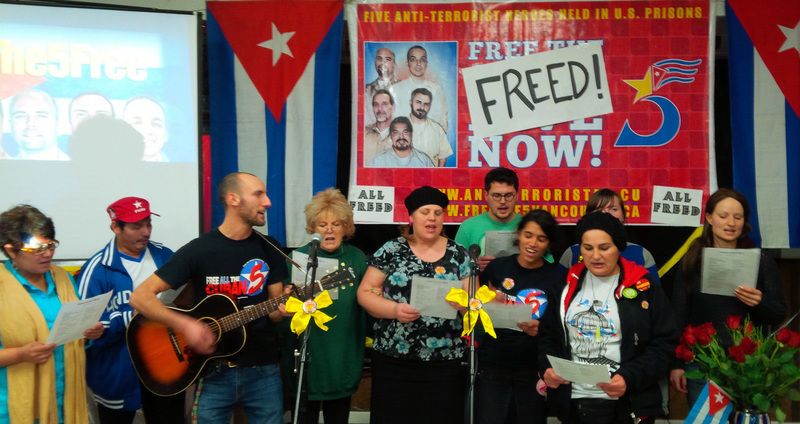 For more than a decade, the Cuba Subcommittee has had a leadership presence in solidarity work supporting the Cuban 5, and a number of NLG lawyers have been counsel in seeking to gain their freedom though the courts. The Cuba Subcommittee has helped to embrace the newest generation of Guild leaders into the Guild’s proud tradition of solidarity with the Cuban people. The NLG Cuba Subcommittee is indebted to Franklin Siegel for preparing this summary in May 2015. To join the Cuba SC, our listserv, for more info, email: aheitzer@igc.org.